They still provide by far the most popular Christmas feast and the meat is gaining general acceptance throughout the year too but turkeys are often overlooked by the small-scale keeper in favour of chickens or other livestock so I decided to take a long overdue look at these portly, puckered poultry. 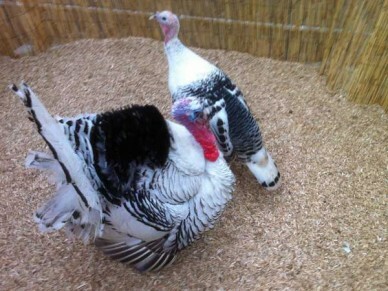 There are currently 10 recognised breeds of turkey in the UK all of which are descended from wild American birds. Males are referred to as stags, females are hens and youngsters chicks or poults. The range of colours includes: black, bronze, red, pied, slate blue and white. Originally brought over from North America to mainland Europe with the Spanish Conquistadors, they were introduced to the UK in the 16th Century. Several breeds were developed throughout Europe with some even shipped back across the pond where they have been re-crossed with the wild variety to create new standards over there. As well as the pure bred varieties there are now commercially developed birds that are faster growing and have broad, ‘double breasted’, characteristics. As with all livestock, including chickens, you need to make sure that you are actually allowed to keep turkeys on your land. Although you don’t have to register your property as a holding for turkeys it is not unusual for terms in your deeds to forbid the keeping of certain livestock and/or poultry. You also have to consider noise. 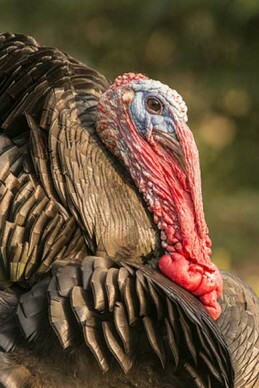 Female turkeys do have quite a vocabulary and mature males do gobble vociferously. If raising for Christmas this does not usually present a problem but if you intend to keep them for a longer term it’s perhaps worth a discussion with any close neighbours to avoid complaints later on. As with chickens, if you aren’t intending to breed, you can of course keep hens without a stag. All are big birds, although the impressive plumage of male birds can make them seem even bigger than they actually are. With a good wind behind them and a slope to launch from male birds may be able to take to the air for short distances but will generally stay on terra firma. If they do feel inclined to perch in a tree they generally prefer to hop up the branches rather than fly. However, females are perfectly capable of flying at a reasonable height and distance. Remember this when devising a daily routine as, given the chance, ‘untrained’ birds will often take to the trees to roost. If your interest is mainly birds for the table these commercial strains are a good bet. The fact that they are raised in their thousands for supermarkets has no bearing on the ability of the smallholder to achieve an excellent quality finished bird at a more personal level. 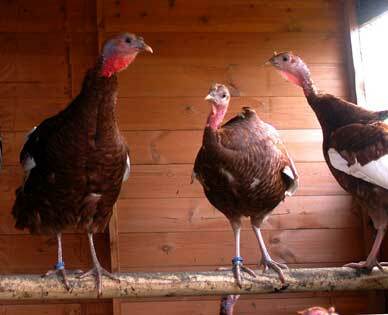 For those of you who want to go with a traditional breed the clear favourites are the Norfolk Black or the larger Bronze (lead pic) which is very similar to the wild Eastern turkeys they are descended from. Other varieties can still be used but many have been developed more for exhibition than the table so may prove to be lacking in bulk. Alternatively, if meat is not your primary concern, the attractive looking Cröllwitzer (pied) variety, which is well suited to the show pen, is also a good egg producer. Turkeys require a larger area than chickens for housing but four birds can be accommodated in a 6′ x 4′ (1.8m x 1.5m) shed with space requirements growing proportionally for larger numbers ie 6′ x 8’ (1.8m x 2.4m) for six birds and so on. Make sure there is adequate ventilation – without being draughty – but ensure ventilation holes are secured with wire to deter predators. They will also need a sturdy three inch diameter perch about two feet (60cm) from the ground – any higher than this increases the risk of injuries, which can lead to the condition bumblefoot, when they jump down. If you are intending to house them inside over winter space requirements will increase again. It is important to keep litter clean and dry as mould spores and the bacteria and ammonia from faeces can cause all manner of respiratory problems. 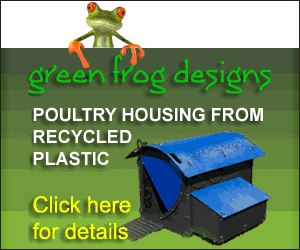 Dust extracted wood shavings or preparatory products such as easychick make a good litter for internal housing. It’s perfectly reasonable to consider turkeys for a backyard but you need to make sure you can fulfil your responsibilities to provide a stress free environment. If you do need to confine them your pen will need to be at large enough, engaging enough and at least 6’ (1.8m) high to discourage escape – even then a determined female could still escape unless the run is fully enclosed. You may also think that their more impressive frame would deter foxes or other predators but this is absolutely not the case and you still need to take security very seriously. From birth turkeys require a higher level of protein in their diet than chickens. Special turkey formulas are available from chick crumb through to growers and finisher pellets. These can be supplemented with a handful of wheat in the afternoons from around 16 weeks. A supply of fresh water is essential as drinking from muddy puddles or other unhygienic sources can be a contributing fact to the spread of disease. You will also need to make sure that they have access to grit to aid digestion whether it’s available via forage or supplied by you. If you are keeping your turkeys as pets they might like the occasional grape, peanut or ear of sweetcorn as a treat but, for those being reared for meat, treats are unnecessary and can affect the growth cycle. Feeding schedules for raising chicks from day old are discussed in more detail below. 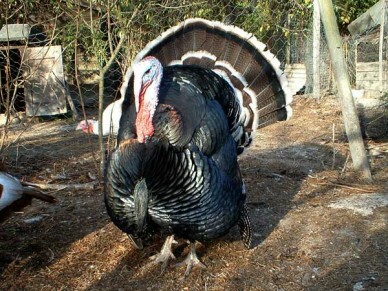 Adult turkeys are fairly robust and cope well with the UK weather. The main concern for keepers will be blackhead disease (histomoniasis) which affects the liver and is caused by a protozoan parasite. Chickens can be carriers but tend to be quite resistant whereas it will, more often than not, kill turkeys. For this reason it is not recommended to keep turkeys with chickens or on land previously occupied by them. Strangely, although it can cause some bluish discolouration of the head, the condition is more easily identified by yellowish, watery droppings. Since the most effective treatment for blackhead was banned in this country the only real way to prevent the disease is through good husbandry including a regular, 6 weekly, worming routine that can help disrupt the lifecycle of the worm. Flubenvet is the only licenced wormer for poultry in this country and is available via vets or licenced online suppliers. Blackhead aside you should also be vigilant for more general poultry diseases such as mycoplasma and coccidiosis which are serious but can be treated more effectively if caught in time. The time to start raising for Christmas is largely dependant on the type of bird you chose. Traditional breeds are slower to mature than commercial stock and these will usually be hatched in May or June as opposed to July to achieve size by December. However, growing your birds more slowly improves the taste so it can be better to start them earlier and have them on a holding ration, such as white oats, for the few weeks up to Christmas. Flavour is also improved if you hang the complete bird for about a week before eviscerating a couple of day prior to use. On your first attempt you may want to start with 6 week old poults, which, by this age, are fully feathered and a bit more robust than the notoriously feeble youngsters. These older birds will also be fully conversant with eating and drinking – something chicks may need to be shown. However, it is more rewarding for the beginner to raise stock from day old chicks. Day olds will cost about £4 each (much less than poults that can be up to £12) and you will need to provide a safe, draught free environment with a heat lamp for anything from 3-6 weeks depending on the time of year and ambient temperature. Judging temperature can be difficult at first but if they are panting move the lamp up a bit and if they are huddling together it is probably too cold. Be prepared for some mortality in your chicks, especially if you have many brooding together, as they can easily get suffocated or squashed when in groups. Make sure you have appropriate chick drinkers too as they can also drown in even relatively shallow water. Note: You should never hatch or brood turkey and chicken chicks together as the chickens are generally much stronger. For the first 4-6 weeks feed only turkey crumb, which is high in protein, before gradually introducing turkey growers pellets which they can remain on until 12-16 weeks. They can then be switched to a finisher ration or breeder ration depending on whether you are rearing for the table or as a pet/show/breeding bird. Note: Turkey feeds will often recommend a feeding schedule on the packaging. 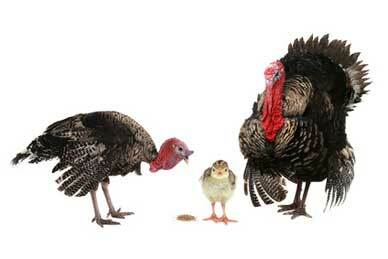 Make sure you have a local feed supplier who stocks or can order turkey feeds as not all carry them as standard. If you do want to hatch eggs turkeys do make good mothers and hens do go broody readily. Mating season starts around the end of January with laying starting about a month later. During this time many keepers will put turkey saddles (canvas or leather waistcoats) on females to protect them from injury by amorous males. Eggs take 28 days to incubate and during this time you may need to encourage the mum to take food/drink/poo breaks as they can become preoccupied, or even obsessive, and ignore these fundamental bodily functions. When hatched they will need their own space. This shouldn’t be too removed from the main flock (to avoid re-integration problems) but allow some space and privacy for the new family. 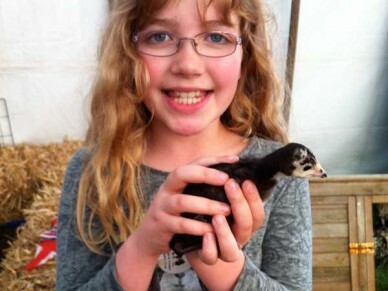 If you don’t have an obliging turkey hen, a broody chicken hen or mechanical brooder can also be used to hatch chicks which can then be moved to a brooding area and raised as above. When the time comes this should only be undertaken by someone who is trained and licenced so you need to ensure that either you have the qualifications in place or that you have a local supplier who can act for you. Even if you are experienced in dispatching smaller poultry such as chickens, handling a 25lb+ turkey can be somewhat different and other, more appropriate, methods can avoid damage to the carcas (important if you intend to sell to the general public) or injury to yourself. It goes without saying that Christmas will be a busy time and if you do need to employ someone make sure you book their services in advance to avoid having your festive dinner still wandering around the yard over Yuletide. If relying on a third party it is worth checking that there is some system in place to identify your birds throughout the process as it is not unknown for them to get mixed up and return the wrong birds. 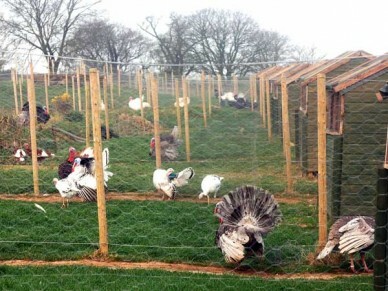 Whatever way you intend to raise your birds you would be well advised to join Turkey Club UK which offers support and advice for new and experienced keepers alike and will have the best contacts for stock. The club also runs an annual show, at the National Poultry Show, which is a great place to see the various breeds and talk to owners. Turkey eggs are large and attractively speckled. They taste very similar to chicken eggs but are highly prized for cooking and baking as they are thought to impart an extra richness. A hen can lay up to 100 eggs during the laying season which usually starts in March and continues until July. A single turkey egg can fetch 70p or more. Turkeys, not just for Christmas? Okay, some are, but as with any livestock you must consider how they will be cared for if you need time away for holiday or sickness etc. Your responsibility remains whatever the reason for your absence so make sure you have a strategy in place for care during these times. So should you consider Turkeys as your poultry of choice? Stag turkey showing elongated snood and caruncles – the ladies find this attractive believe it or not! These impressive looking birds are less likely to be kept as pets but there is a lively show scene and they do offer the prospect of a niche product/income from the eggs, being highly regarded by bakers, and wing feathers that are used to fletch traditional style arrows. The fact that commercial breeds reared for meat, even from day old chicks, can take only six months may also be appealing for those who would rather not be tied by their livestock all year. All-in-all, turkeys offer a great alternative to chickens, or even other livestock. Even factoring in the concerns over blackhead and the slightly weedy disposition of the chicks, with good husbandry, they shouldn’t prove any more difficult to keep. Is bigger better? That’s for you to weigh up.